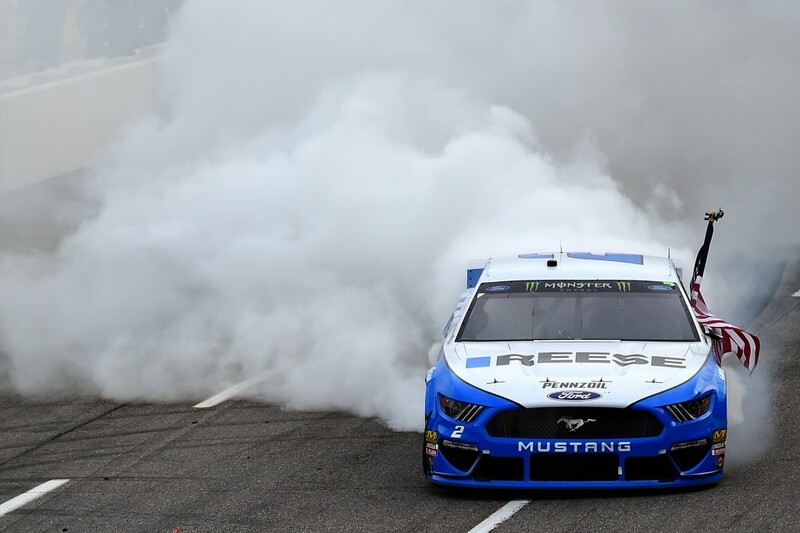 Brad Keselowski held off a hard-charging Chase Elliott to win Sunday’s STP 500 at Martinsville, giving the Ford-Team Penske squad its third win in six races so far this year. Keselowski led 446 of 500 laps, but the Michigan native’s day was far from easy. The No. 9 Hendrick Motorsports Chevrolet Camaro ZL1 of Elliott appeared to be the stronger car for much of the day, with the No. 9 even passing the No. 2 for the lead on lap 325 following a restart. After a caution came out on Lap 372, Keselowski, Elliott and the rest of the front-runners went to pit road. The Team Penske crew put Keselowski out front for the restart with a fast pit stop, who then held off Elliott for the remaining 120 laps. Elliott was also feeling the pressure from Joe Gibbs Racing’s Kyle Busch in third, but lapped traffic held the No. 18 Toyota Camry up and allowed Elliott to put a space between Busch and him. Ryan Blaney also put in a strong showing for Team Penske and Ford, coming home fourth, while Busch’s JGR teammate Denny Hamlin completed the top five in his No. 11 Toyota. Elliott was the only Chevy driver to crack the top 10. Austin Dillon finished 11th, leading a series of Chevys over the line that included Kurt Busch, Ty Dillon and Alex Bowman, who took 12th, 13th and 14th. Click here for full results from the 2019 STP 500 from Martinsville. FOX needs to check their ratings.. as after running their races on a FOX non-cable channel, this last race was FS1 which means unless you have cable TV.. you probably didn’t see the race.